Just weeks away from completion, the Family Justice Center Sonoma County will soon be available to assist victims of family and domestic violence, sexual assault, and child and elder abuse. The center is designed to be a single source location offering comprehensive services for victims of family violence. Currently, clients must travel between numerous county locations to obtain assistance and support related to an assault. The Family Justice Center services will include assistance in shelter and housing, counseling and advocacy, and legal assistance, as well as on-site access for law enforcement investigation and prosecution attorneys. Clustering the services together provides a client-centered approach that will improve the quality of support, minimize travel between services and enhance prosecution success while reducing operation costs. Community based support organizations to be located in the building include the YWCA, Catholic Charities, Council on Aging, Verity, Family Youth and Children Services, and Legal Aid of Sonoma County. County support services will include the District Attorney’s domestic violence advocates and attorneys, victim’s claims assistance specialists, child protective services, and County Sheriff’s investigative detectives. Local law enforcement investigators, including the Santa Rosa and Sebastopol Police Departments, will also be on site. “The design approach is to provide a place of safety, healing, advocacy, confidentiality and change within a warm and nurturing environment”, said Dennis Kennedy of TLCD Architecture. Clients will be greeted at the entrance and escorted into the ‘nest’ where an intimate and homelike atmosphere will be provided. Inside the nest are quiet rooms for conversation between victims and their advocates, with two rooms overlooking the children’s area. A space to research support services on-line with assistance from advocates is adjacent to the quiet rooms. Victims will remain in the nest while obtaining services. 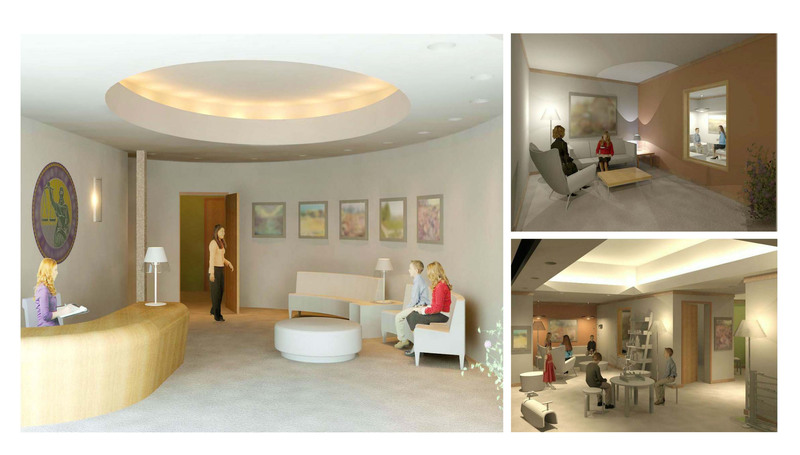 Advocate spaces surround the nest, providing staff direct access to the safe area where they may meet with the victims. For additional information on Family Justice Centers worldwide, please visit http://www.familyjusticecenter.org/.